The view looking towards Pontypridd from Abercynon North station. 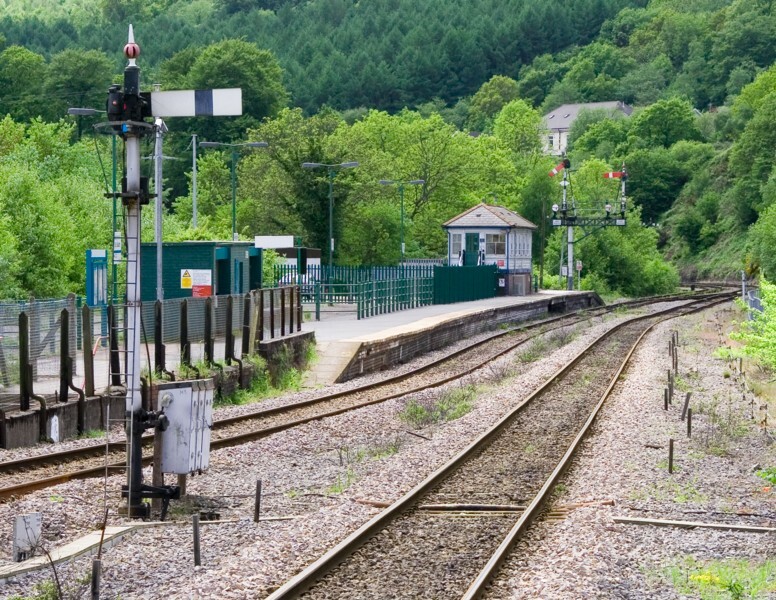 In the middle distance is Abercynon South station, with the signalbox on the platform and where the Merthyr (left) and Aberdare (right) lines converge into a double-track section. 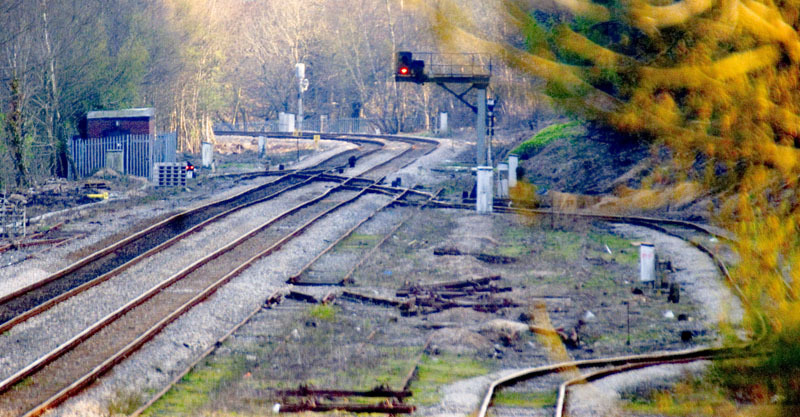 The signal in the foreground is the up starter for the Merthyr line. 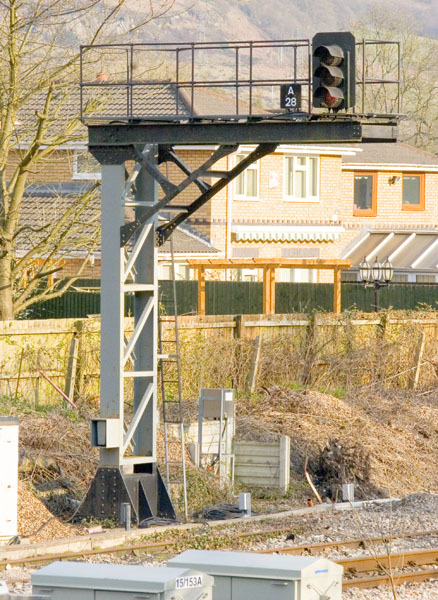 The rears of the arms on the up junction signal can just be seen to the right of the down starters bracket. 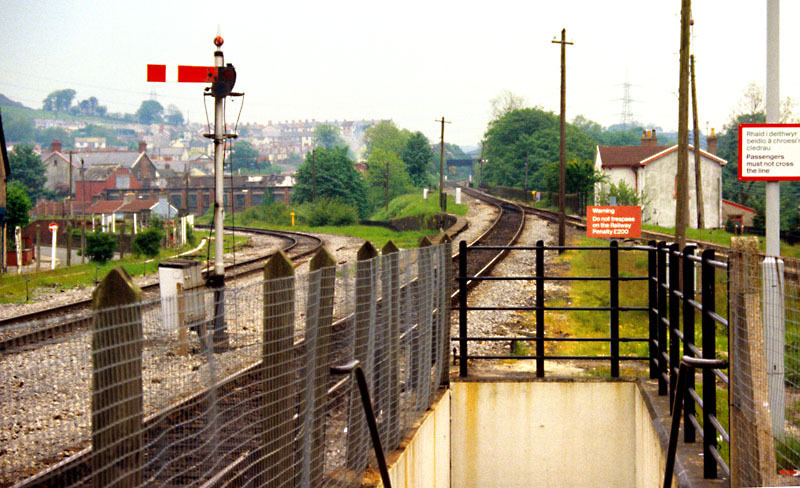 This is the converse shot to the above, taken from the South station with Abercynon North on the left and the Merthy line to the right. 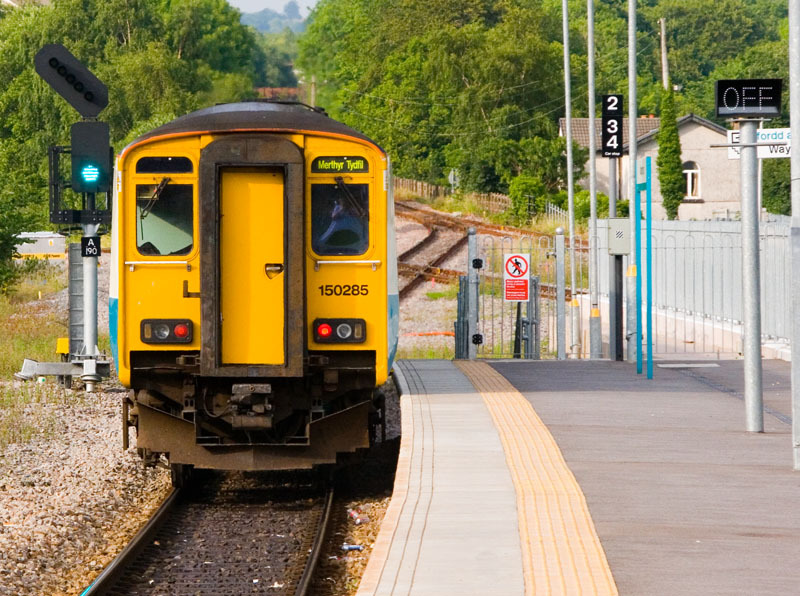 The up starter to Aberdare can be seen beyond the North station platform. In the foreground is the up Merthyr starter (A4), while the rear of the down innerhome can be seen beyond it. The view towards the station from the road bridge over the Merthyr line in the distance in the photo above, showing the face of the down innerhome (A33). From the other side of this bridge, the rear of the down Merthyr outerhome can be seen. 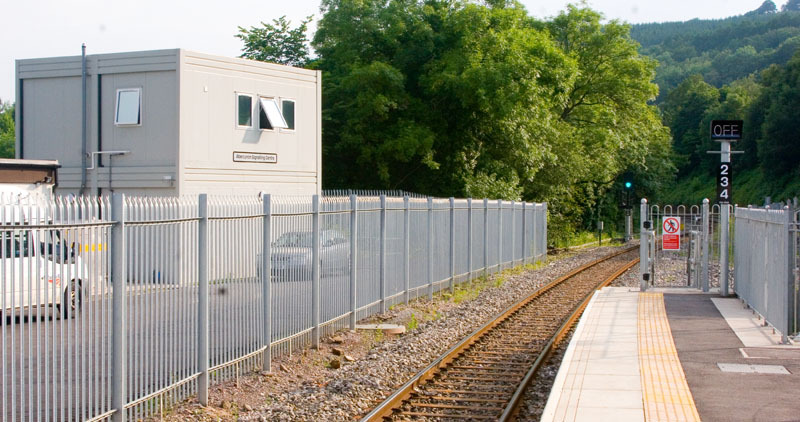 The up Aberdare starter (A6) at the end of the platform at Abercynon North. The down starters bracket (A32/A29). 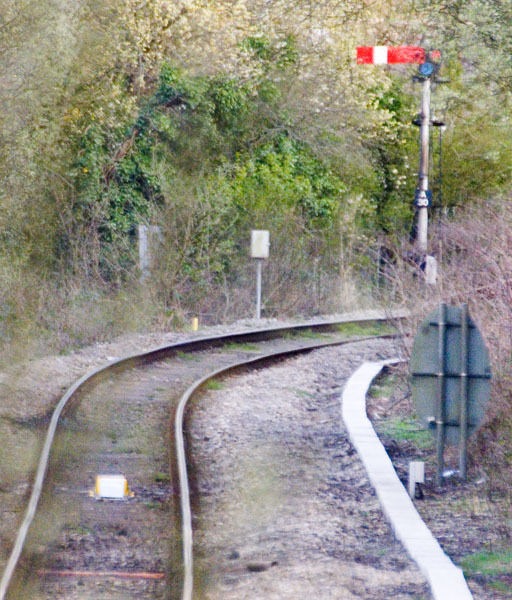 Beyond the signal box is the facing junction crossover. 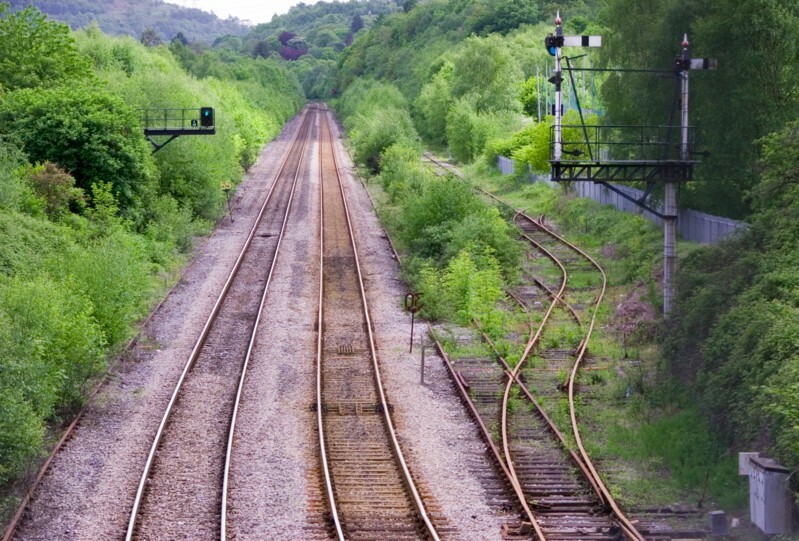 There is a trailing crossover just out of view which allows trains from Aberdare to join the down line. 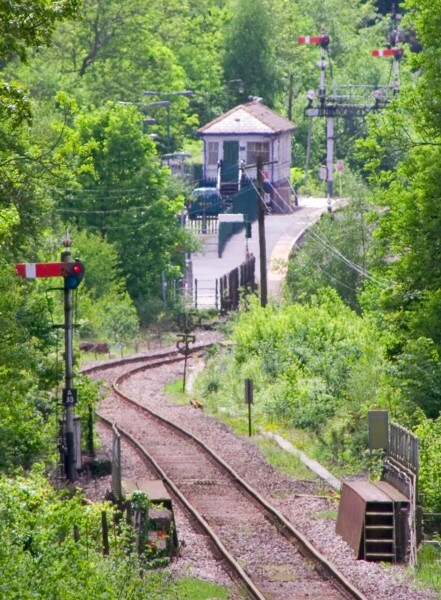 In the foreground the point rodding run can be seen. 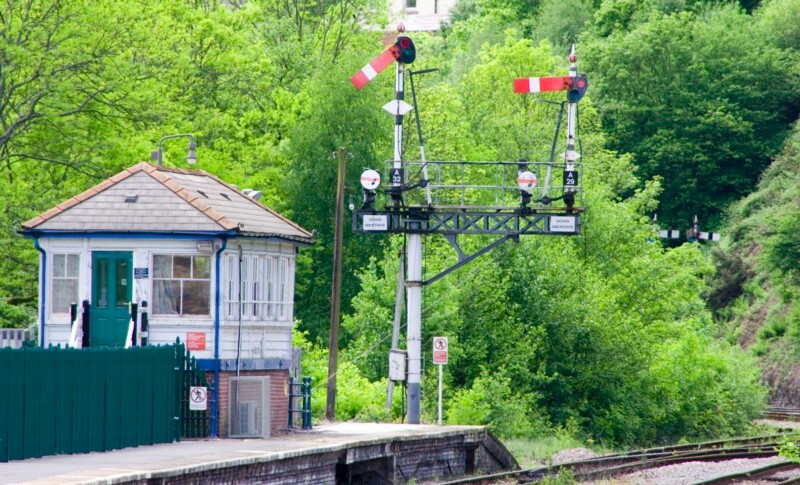 The opposite side of the valley offers a great view of the signalbox. The starter cleared for a down Merthyr train. The rears of the up junction homes are visible in the background. The no-admittance sign by the signalbox door. 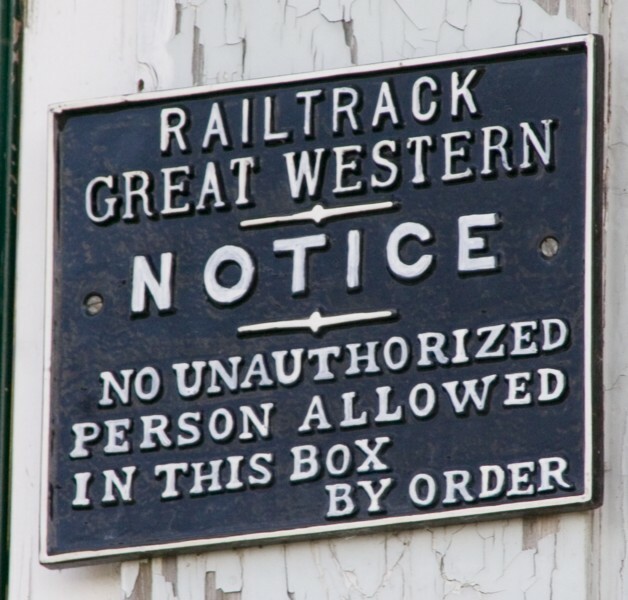 This looks like a GWR sign that has had the name of the company changed. In other places, for example Banbury, these signs still say "Great Western Railway". Looking back towards the stations from south of the junction, this pair of discs can be seen. The right-hand one presumably applied to the now derelict line to its right, probably a former down goods loop. The view in the opposite direction, towards Pontypridd. The down advanced starter (A28) is on the left, with the up main and goods loop intermediate homes opposite. The intermediate homes for the up goods loop (A10) and the up main (A2). Peering into the distance towards Pontypridd, the former Stormstown Jct, now controlled remotely from Abercynon, can be seen. On the right is the advanced starter from the goods loop. What a difference! For reasons I'll come on to shortly, all the overgrowth has been cut right back and we can actually see the layout properly. 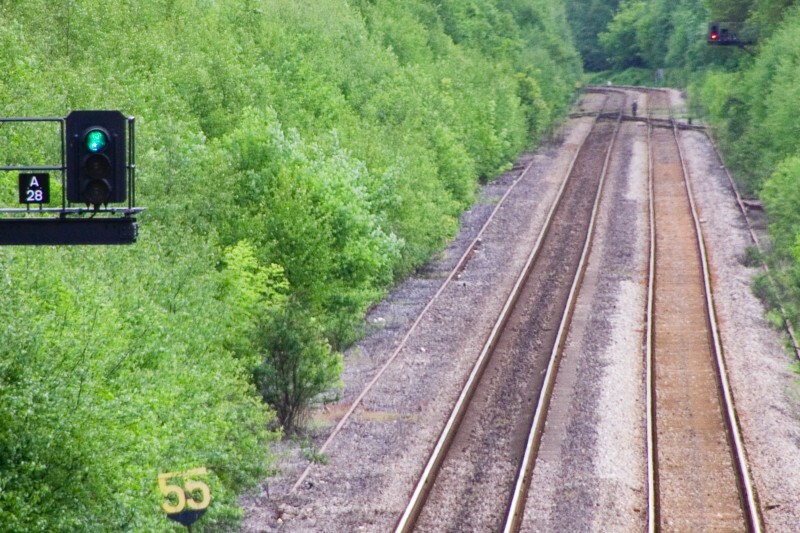 An empty DMU trundles along the up loop, while the remains of former up and down through sidings and the layout at Stormstown Jct are readily visible. The down home on the Aberdare line. 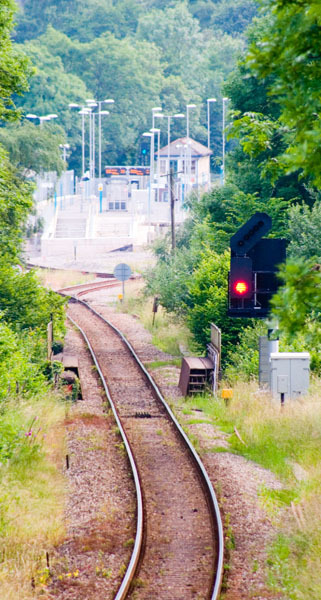 Now the vegetation has been "managed" it's also possible to get a better sight round the curve to the junction signal. 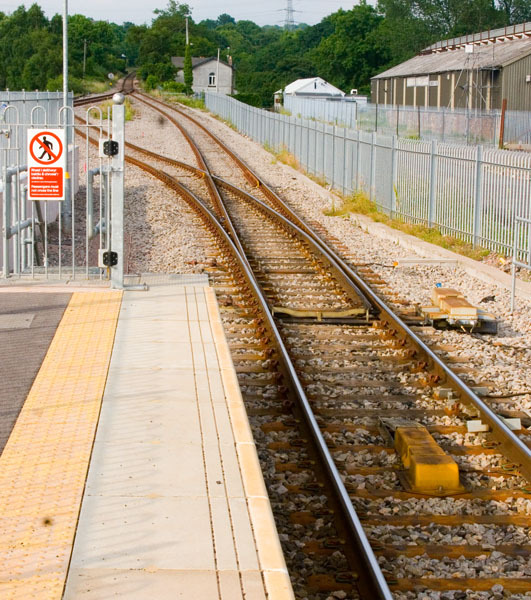 The start of the former down loop can also be seen on the right, the disc for setting back from it now removed. A train passes the up intermediate home. A closer view of the layout at Stormstown Jct, with the colour-light up home in the far distance. 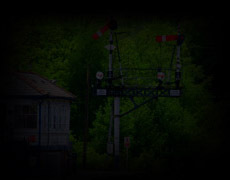 The colour-lights on the right will replace the semaphore bracket in due course. 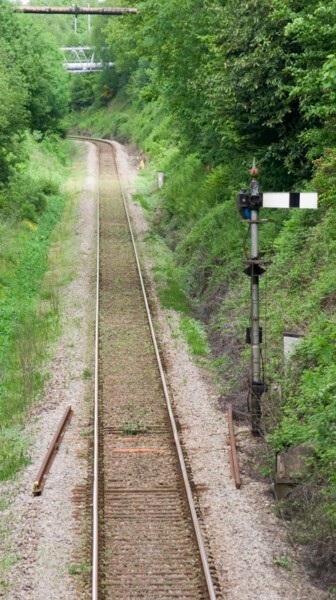 A closer view of the junction signal (up innerhome), cleared for a Merthyr train. Unusual for the spectacle case not to be painted black. The disc for setting back movements into the up loop. 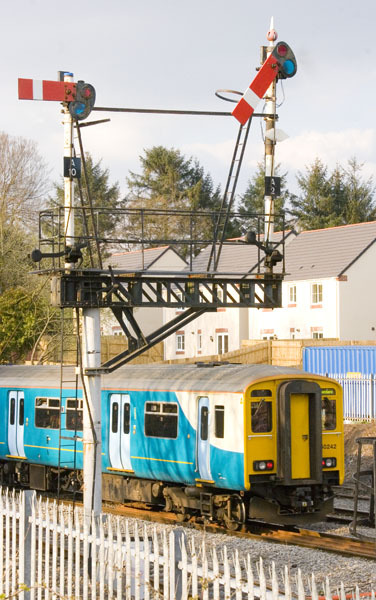 The signaller gives the driver the token for the single-line section to Merthyr. 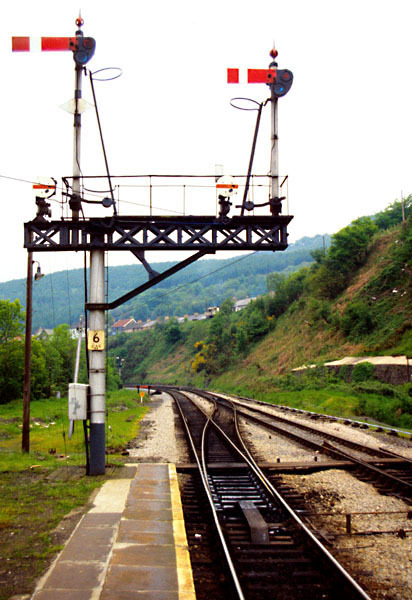 The mechanical signalbox and all the sempahores here were abolished in 2008 when the Merthyr Tydfil line was resignalled to provide for a half-hourly passenger service. 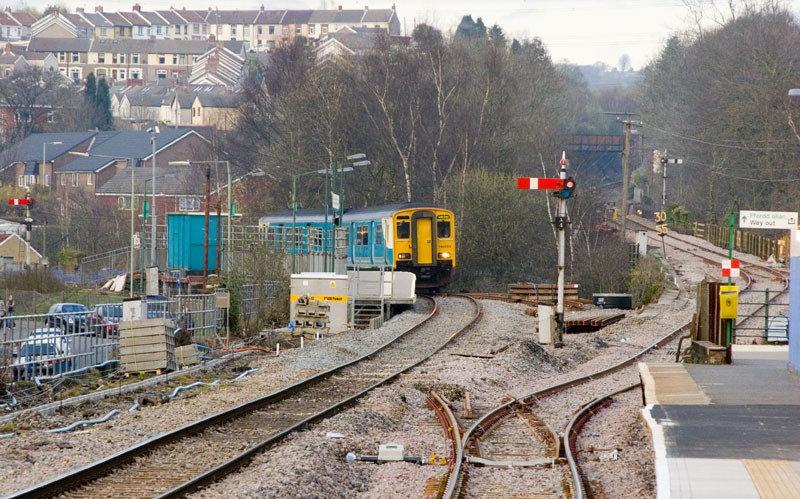 This is the Cardiff end of the reinstated down platform, with the new signalling centre on the left and A197 signal beyond. 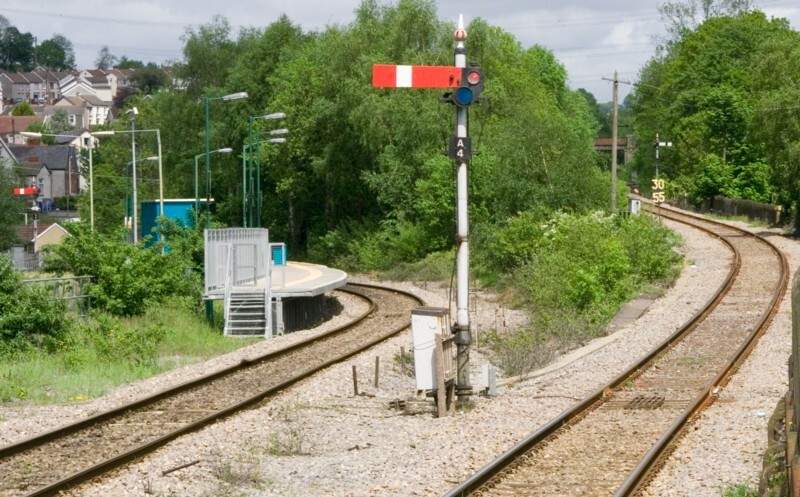 To the right is that signal's platform repeater. 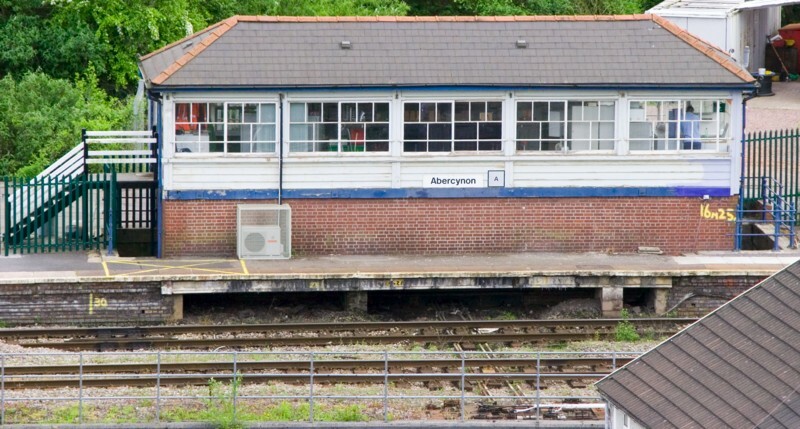 The former signalbox building remains, though, because it still houses the relay room for the earlier Aberdare line resignalling. 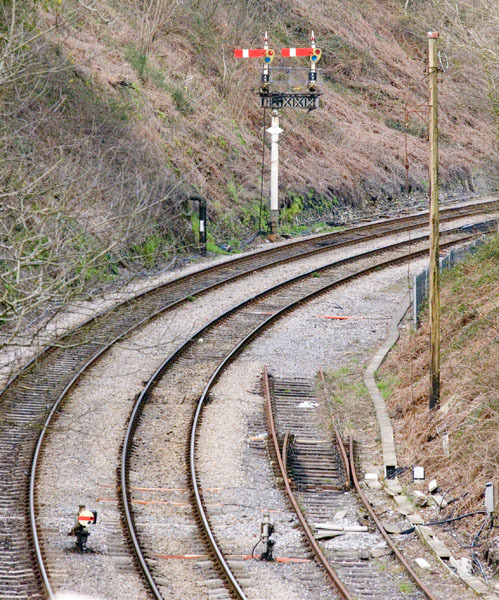 The new junction at the north end of the station, with A190 signal cleared for a train to Aberdare. 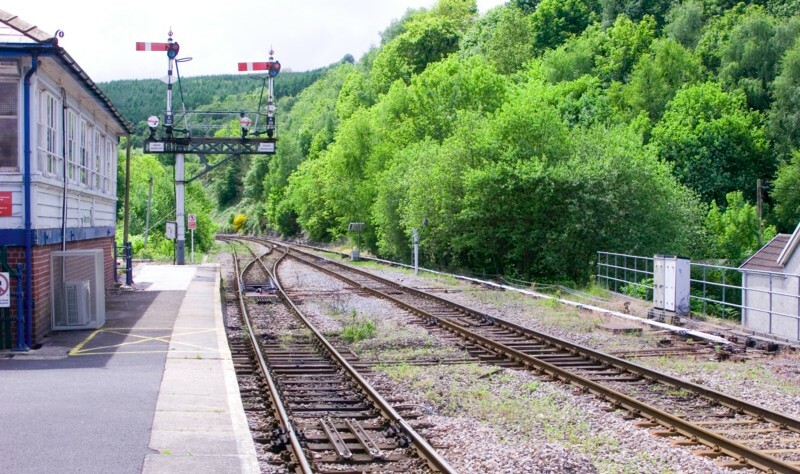 The big advantage of this change is that all trains can now use this station, with the North station the Aberdare line trains formerly had to use now closed. 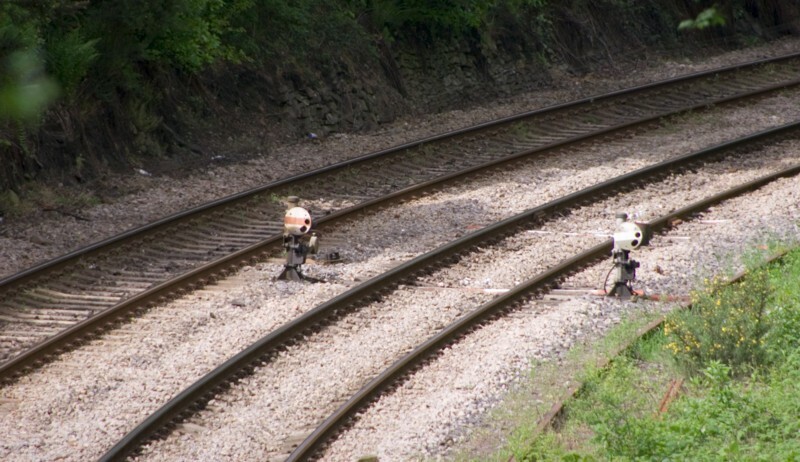 The trailing junction where the down Aberdare and Merthyr lines now converge. The two boxes as seen from the far side of the valley. 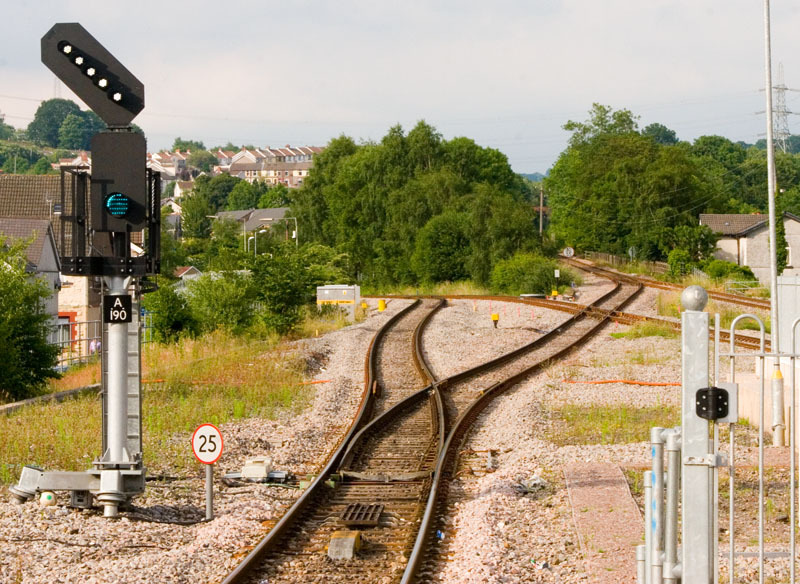 A closer view of the new Signalling Centre. 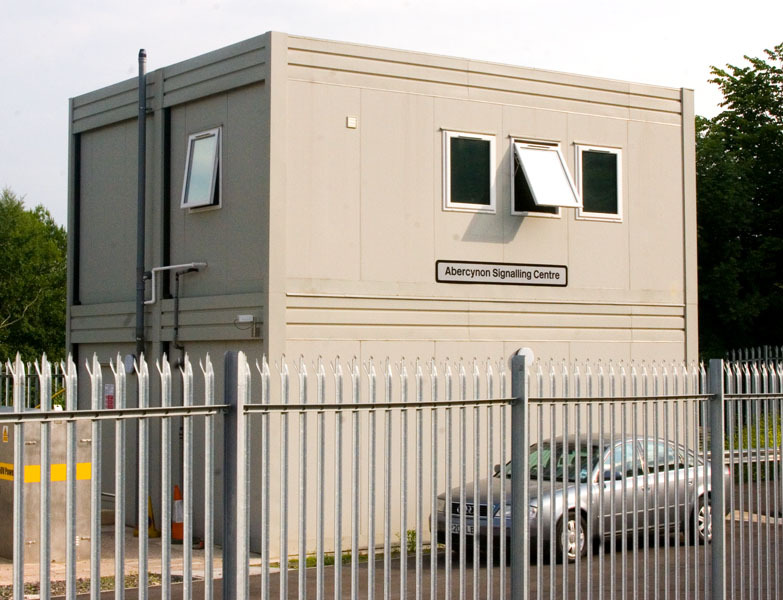 This is only intended to be an interim installation - control will in due course be relocated to the new South Wales Control Centre in Cardiff. 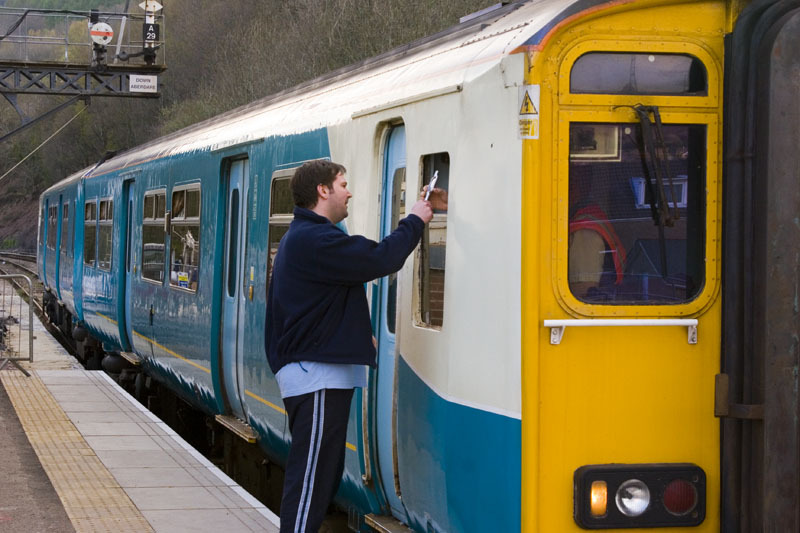 An up train to Merthyr departs. 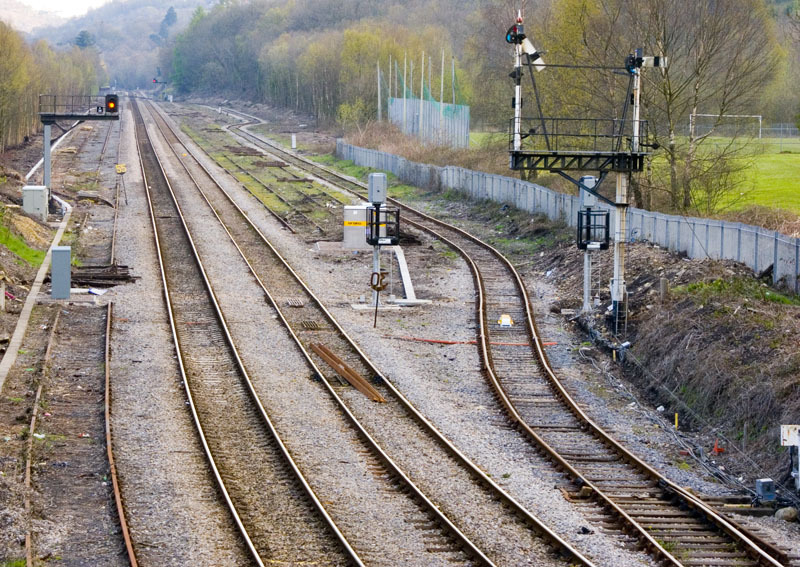 Again, note the platform repeater on the right. 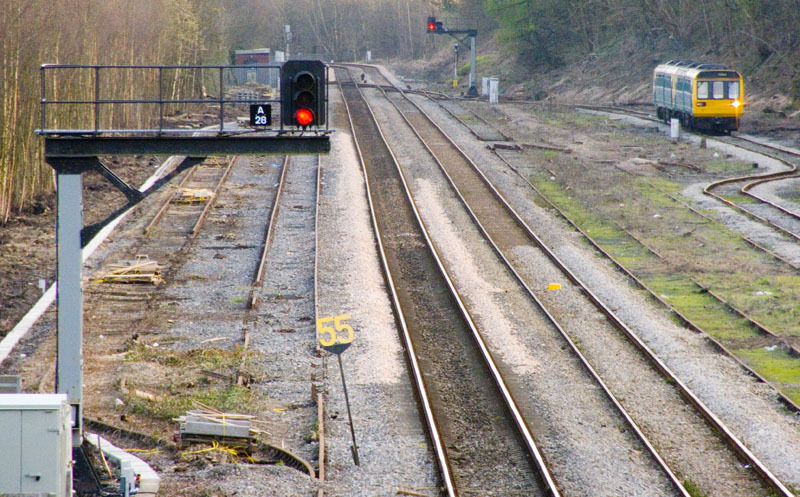 The approach to Abercynon from Merthyr, with A195 signal in the middle distance. 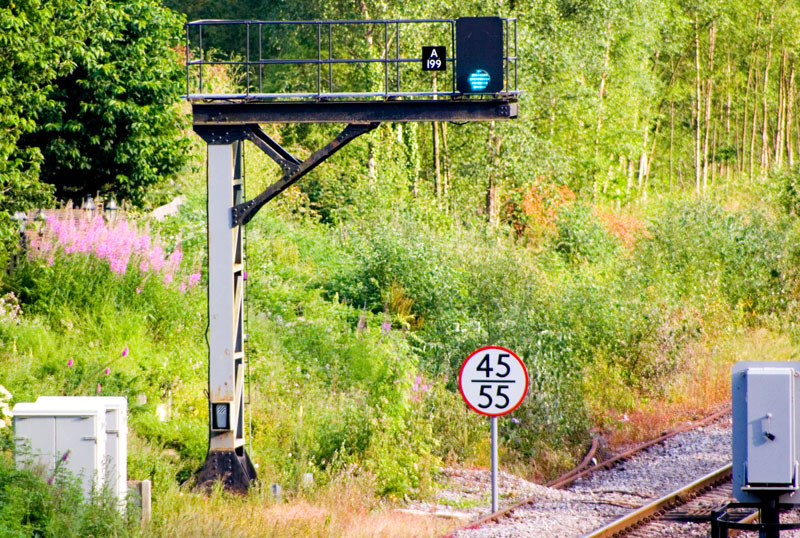 If necessary, down trains can be signalled into the up platform using the route indicator. 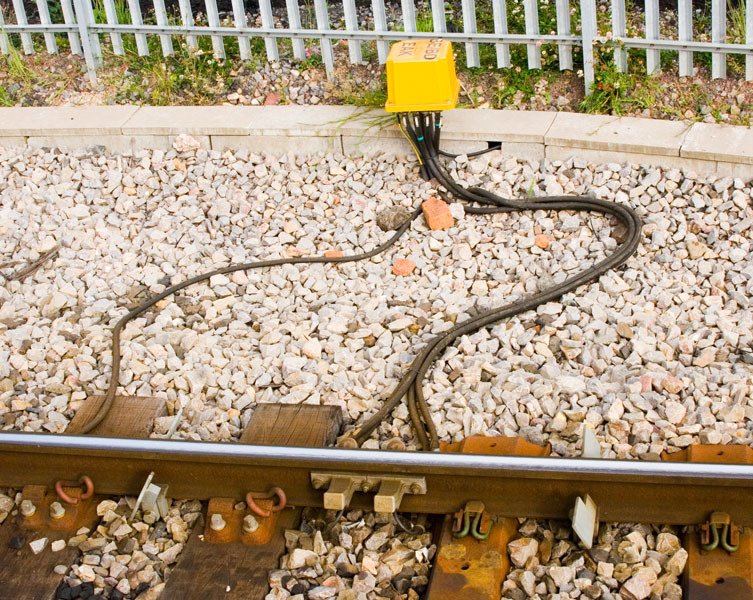 One of the axle counters used by the new signalling system. 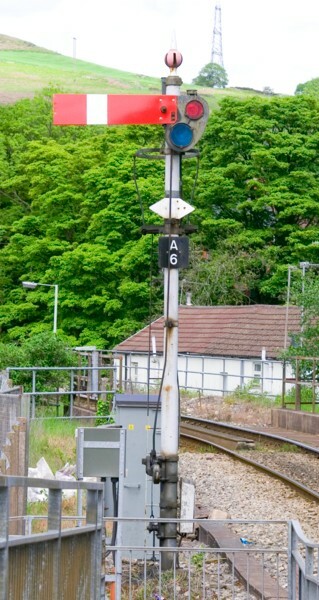 A closer view of A199 signal, which is on the same post as the former down advanced starter A38. 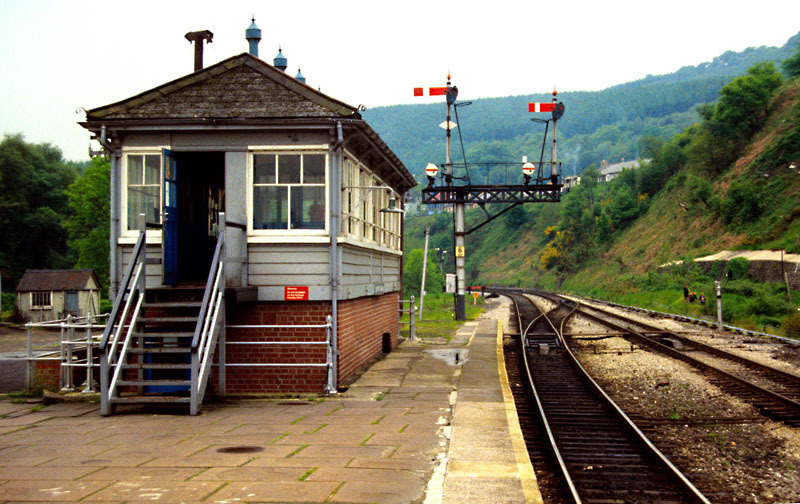 The view north in 1983. At this time the original line around the far side of the island platform was still in place, though only as a dead-end (runoff?) siding. 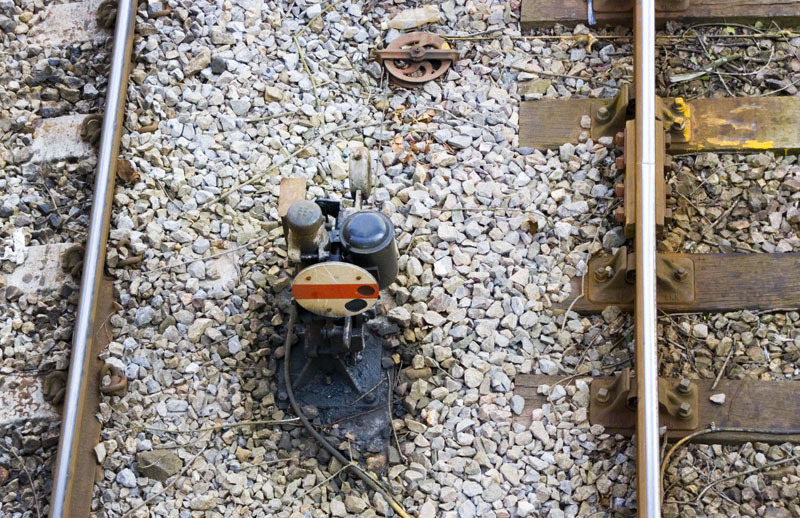 The signalbox and down starters. The Aberdare branch was only a goods line back then. A closer view of the above bracket. 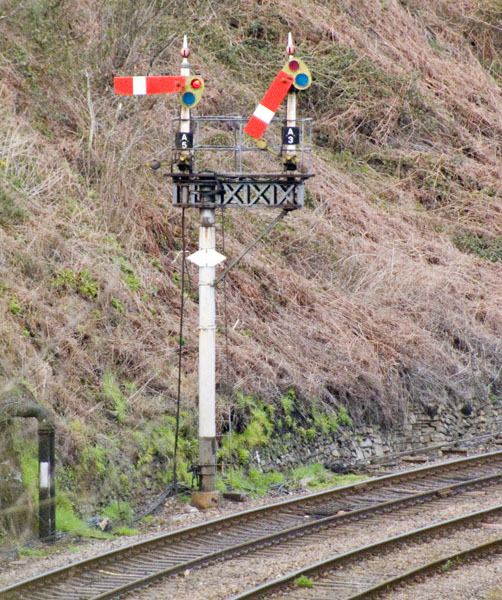 Note also the trap points in the Aberdare line and that the junction signal, in the distance, also appears to have a lower-height 3' goods arm for the branch. 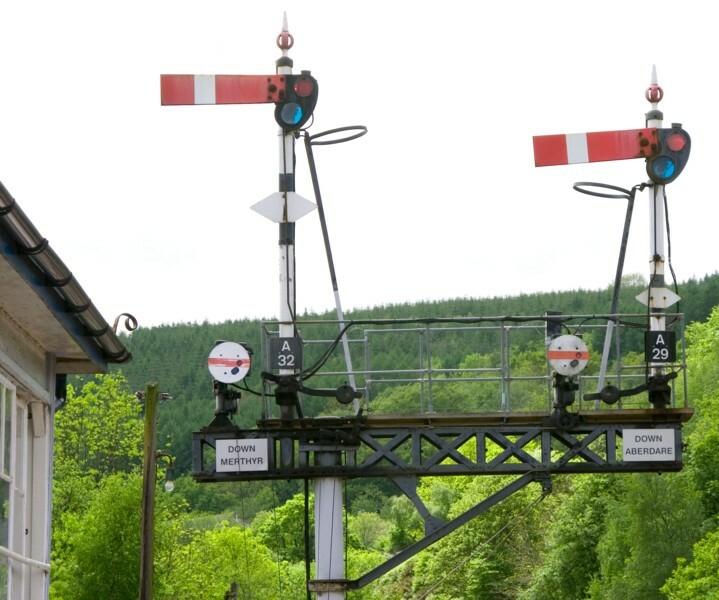 After the reisignalling, most of the semaphore equipment, including the down starters bracket, was acquired by heritage railways such as the GW(S)R.
More information about the new Abercynon signalbox can be found on the Signalling Notices site.